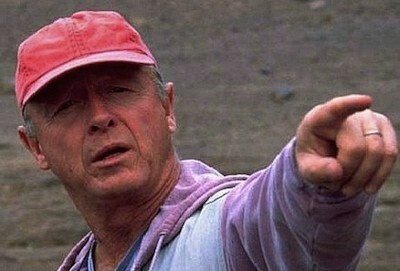 I was saddened to learn this morning that director Tony Scott had committed suicide yesterday at the age of 68. Few contemporary directors have matured more interestingly than he did, and few took advantage of the Hollywood blockbuster for more idiosyncratic ends. The fascinating thing about Scott's body of work starting with Enemy of the State—an impressive run that includes some grand entertainments (Spy Game, The Taking of Pelham 1 2 3, Unstoppable), two compelling failures (Man on Fire, Domino), and one masterwork (Deja Vu)—is that it didn't contradict the crass, commercial filmmaking of his early successes (Top Gun, Beverly Hills Cop II), but rather honed it into a personal, expressionistic style. Where most directors who benefited from the aegis of Jerry Bruckheimer—namely Michael Bay—developed a style based on blunt, constant spectacle, Scott became increasingly graceful in his approach, at times suggesting an abstract artist adrift in a commercial enterprise. Scott's painterly sensibility was apparent all along, even his dumbest works: check out all the magic-hour shots in Beverly Hills Cop II, which set the Los Angeles skyline against a perfect cool blue. His recent work is instantly recognizable for its oversaturated color, which allows for constant fleeting pleasures amid the violent bombast of the action sequences. The same can be said of his purposely dizzying editing, which advanced the hard-sell spectacle of Bruckheimer's cinema into something else entirely. I'm not sure if the juiced-up montages of his late films were even intended to be pleasurable; they overwhelm in such a way that all you can appreciate, really, are their rhythms. And yet few films have as much to say about the information overload of 21st-century life: one could program a brilliant, if exhausting, double feature of Domino and Olivier Assayas's Demonlover. Scott shared with Assayas—and any number of French art house directors—a sly self-awareness about his position in film history. As he got older, his films became more referential, deriving some of their meaning from how they remixed older movies. This quality becomes central to Scott's films with Enemy of the State, in which Gene Hackman knowingly sends up his performance in The Conversation, and it continues into the charming self-parodies he elicited from Robert Redford and John Travolta in Spy Game and Pelham respectively. But Deja Vu represents the peak of Scott's information-clogged worldview, blending Preminger's Laura, Hitchcock's Vertigo, his brother Ridley's Blade Runner, and countless other sci-fi movies into a reasonable approximation of what it's like to work for the Department of Homeland Security. Christoph Huber and Mark Peranson wrote an exceptional piece on the film for Cinema Scope several years ago; if you're looking to celebrate Scott, I'd recommend reading that before you look up any formal obituary. Interestingly, Scott's quick-cut filmmaking allowed increasingly for intrusions of reality while his cinematic allusions grew ever denser. One of the chief pleasures of his 21st-century work is in seeing how skilled professionals went about their jobs—be it the reality TV producers of Domino or the train-control staff of Pelham. In these films, Scott heightens a traditional sense of action with his restless curiosity about working life, filling in every spare second with a telling detail about professional procedure. His last film, Unstoppable, represented a breakthrough in that the spectacle of work (in this case, steering a runaway freight train) managed to overwhelm most other expectations of the action film. The movie, as breathtaking as any of Scott's other successes, didn't feature a single gunfight. It suggested that Scott was continuing to challenge himself and evolve as an artist. Sadly, we won't get to see any further developments.